As a Five College Professor, Olabode Omojola teaches at Mount Holyoke College and the four other institutions in the Five College Consortium: Amherst, Hampshire, and Smith Colleges, and UMass Amherst. Omojola teaches one course at UMass every two years, in rotation with the other Consortium members. 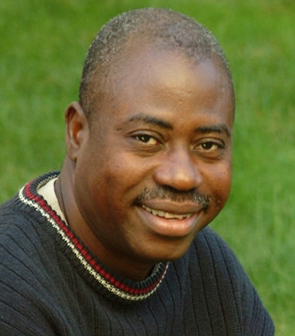 He taught previously at the University of Ilorin in Nigeria and at Northeastern University in Boston. Omojola is the recipient of a number of prestigious fellowships, including the Radcliffe Institute fellowship in musicology at Harvard University (2004–2005), the Alexander von Humboldt Foundation fellowship at the University of Cologne, Germany (1996–1998), and the Northwestern University African Humanities Fellowship Program in African music, which was hosted by the University of Ghana (2000). A former co-chair of the African music section of the Society for Ethnomusicology, Omojola is the founding secretary of the Nigerian Musicological Society (now the Association of Nigerian Musicologists). He serves on the editorial board of the journal Ethnomusicology. Nigerian Art Music: with an Introductory Study of Ghanaian Art Music (Institut Français de Recherche en Afrique, 1995). Omojola has directed productions of two major Yorùbá operas, Kola Ogunmola’s The Palmwine Drinkard (based on Amos Tutuola’s novel) and his own work, Queen Moremi, which is based on the Moremi legend of the Yorùbá people. The two works were performed by Five College African music students, supported by professional musicians and choreographers, and were jointly produced by Mount Holyoke College's Department of Music and Department of Theatre Arts. Omojola received his B.A. in Music from the University of Nigeria, Nsukka; his M.A. in African Music from the University of Ibadan, Nigeria; and his Ph.D. in Ethnomusicology from the University of Leicester, England.